Ford STEAM Lab hosted a hackathon for 100 middle school students to introduce them to software development and skills needed to be high tech entrepreneurs. Students from Patrick Henry Middle School in Woodhaven, Mich., took top honors, winning $15,000 for their school and $12,500 in scholarships. Ford and UAW extended to all student participants the opportunity to continue their coding education at a week-long Henry Ford College summer camp. 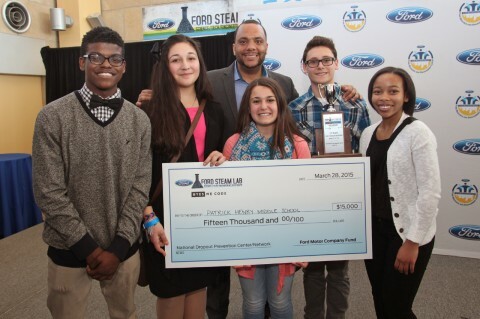 DETROIT, March 30, 2015 â€“ Given the chance to be software designers, 100 middle school students at the Ford STEAM Lab Hackathon invented a range of mobile applications to make learning easier, from catching up on missed assignments, to studying math and music through gaming â€“ all the while earning $42,500 in awards and scholarships. The two-day event that wrapped up Saturday challenged students from five middle schools in the Detroit metropolitan area to learn the basics of software coding, and then produce, or â€œhackâ€� an application to help them in school. Ford is joining with the United Auto Workers union to enable all students who participated in the Hackathon to attend free of charge a summer software coding class offered by Henry Ford College. The one-week long course will be held at the schoolâ€™s Dearborn campus. During the class, students will build their own Android apps from scratch and experience how they are placed on the Google Play market. First Place â€“ Patrick Henry Middle School, Woodhaven, Mich.
App: Second School. What it does: Allows students, parents, and teachers access to students' curriculum away from the classroom, ability to track their school progress in real time, and one-to-one communication between parents and teachers. Second Place â€“ Clippert Academy, Detroit. App: Bookctionary. What it does: A mobile reading assistance application focused on interactive reading comprehension through quizzes, audio assistance, and eBook downloads. Third Place â€“ Simpson Middle School, Flat Rock, Mich.
App: Stems Root Builder. What it does: A learning application focused on keeping students up to date with their course work when they are out of school. App: Exstatic. What it does: An app that combines learning music and math together through a gaming and creative platform. 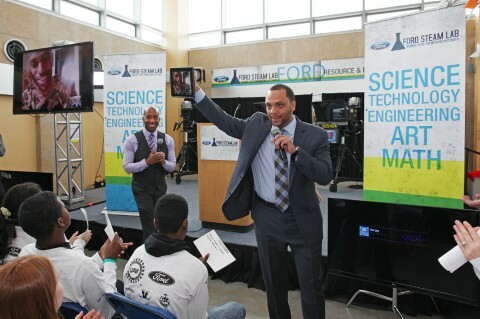 The event occurred at the Ford Resource and Engagement Center in Detroit, where it was part of a live broadcast by MSNBC as part of its Growing Hope series. 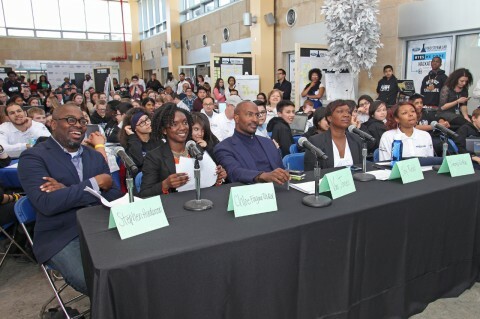 After learning coding skills on the first day, student ideas were judged by a panel that included Van Jones, #YesWeCode founder, and environmental and civil rights advocate; Stephen Henderson, Pulitzer Prize-winning Editorial Page Editor of the Detroit Free Press and co-host of Detroit Today on WDET; and Joy Reid, national correspondent, MSNBC. Students also heard from Big Sean, a Detroit native who has become a multiplatinum winning musician and founder of the Sean Anderson Foundation. Big Sean took a break from his tour in Japan to speak via Skype about the importance of technology and the role of the Internet in future jobs. â€œI can honestly say the Internet really helped me become the artist that I am today,â€� he said.